The terrain of political discourse in 2016 bore some surprising resemblances to medieval and early modern Europe. In the lead-up to the US presidential elections, many Americans trusted in the predictive abilities of polling and algorithms with as much faith as a medieval or early modern parishioner receiving end-time prophecies. Premised on ostensibly scientific protocols, the practice of polling and the language around it has become as rarefied – as impenetrable to the political laity – as the intricate Merlinic prophecies that once circulated in manuscript and cheap print. Nonetheless, communities formed around the data: the left took solace in the proleptic certainty of Hillary Clinton’s win; the right responded to the polling consensus by decrying the elitism of the media and heralding Donald Trump as a savior. The election results produced a crisis for not only US politics and civic life but also for the established discursive practices of what could be seen as prophetic polling. The above comparison demonstrates, as this issue ‘Prophetic Futures’ will explore, how thinking about prophecy and divinatory practices undermines our self-conception as living in a secular modernity – a disenchanted world. As recent political elections demonstrate and as our authors show, prophecy is never a neutral form of discourse. It is a speech-act that, like conjurations or vows, implies cause-and-effect relationships. The language can be poetic, couched in terms of political flattery, lampooned in doggerel, or markedly unadorned. Within the texts of prognostication, prophecy’s anticipatory functions point to its powerful role, or intervention, in a range of genres and discourses. In the medieval and early modern periods, prophetic discourse incited contentious debate about its efficacy or the prophet’s resemblance to the juggler or conjuror. For Montaigne, the verity of divination is less at issue than its epistemic and passionate provocations, for ‘there remain among us some means of divination by the stars, by spirits, bodily traits, dreams, and the like – a notable example of the frenzied curiosity of our nature, which wastes its time anticipating future things, as if it did not have enough to do digesting the present’ (de Montaigne, 2003, 32). Implicit in Montaigne’s discussion is how prophecy can create knowledge, despite its dangers as a confounding, ever-present distraction. Projection of the future and reading the past, for the French philosopher and others, always circle back to the present. 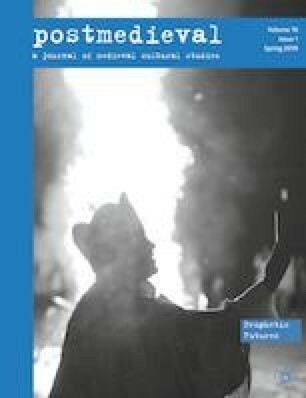 This special issue aims to present new approaches to the study of prophetic discourse, the figure of the prophet, and historicist analyses of the genre in the medieval and early modern periods. We seek also to show how prophecy might shed light on the entanglement of the pre- and postmodern. From a span of historical specialties and disciplinary approaches, our authors collectively focus on three consequences of vatic pronouncement: 1) disciplinary protocols of periodization; 2) the surprising presence of bodies (gendered, racialized, human and nonhuman, alive and dead, whole, and in parts); and 3) scholarly method, including both historicist and presentist approaches. ‘Prophetic Futures’ contributes to the ongoing re-enchantment of modernity, recognizing that a rationalist and Whiggish narrative of history and literature fails to account for the temporal complexities and imaginative expansiveness of the prophetic. The authors in this issue attend to this problem and offer new means for reading the past. In this vein, Eric Weiskott’s ‘English Political Prophecy and the Problem of Modernity’ and Misha Teramura’s ‘Prophecy and Emendation: Merlin, Chaucer, Lear’s Fool’ demonstrate how a focus on the production and circulation of prophetic texts in medieval and early modern Europe necessitates a reconsideration of periodization and textual scholarship. Weiskott’s essay introduces the issue by tracing how prophecy as a literary genre overturns any stable notion of modernity or any binary between the medieval and the early modern. Indeed, the capacious genre of prophetic writing continues along this imposed temporal divide, flourishing, even, in the early modern. Weiskott thus concludes that ‘prophecy lays bare the artificiality of the periodization that still occludes it.’ Teramura’s article offers a granular analysis of prophecies’ defiant historicity by discussing a specific textual example, the use of the popular, but misattributed, ‘Chaucer’s Prophecy’ in the Fool’s speech of Shakespeare’s King Lear. Teramura traces the widespread circulation of Chaucer’s prophecy in the period to offer an argument for how Shakespeare engages with the text as well as making a claim that intervenes in the editorial history of the Fool’s speech. More than this, the article demonstrates how editorial entanglements arose from assumptions about prophecy, thus limning how contemporary editorial practices emerge from the epistemological and disciplinary structuring of modernity that Weiskott studies. In theoretical tandem with Weiskott’s and Teramura’s unsettling of neat periodic division, Nicholas R. Jones’ ‘Valencia’s Miraculous Prophet: The Inquisition Dossier of Catalina Muñoz (1588),’ Penelope Meyers Usher’s “‘The Carcasse Speakes”: Vital Corpses and Prophetic Remains in Thomas May’s Antigone,’ and Marissa Nicosia’s ‘Wasting Time in The Committee-man Curried’ showcase how prophecy leads to a similar reconsideration of the relation between discourse, identity, and the body. In Jones’ study of Catalina Muñoz, an enslaved black woman in early modern Spain, Jones recovers the historical narrative of how she carved out a place of power for herself within the confines of her master’s home, doing so specifically through branding herself as a prophet. Jones identifies ‘Catalina’s racial status as a black African [. . . as a] key variable in analyzing the subversive nature of the prophetic acts located in her dossier.’ Prophecy allowed her to take control over her reputation, or ‘escandolo,’ through which she could highlight – rather than hide or suppress – her racialized, gendered body. Whereas Catalina uses the intersection of the racialization and gendering of both herself and the figure of the prophet in Inquisitorial Spain, Meyers Usher studies, through Thomas May’s adaptation of Sophocles’s Antigone, how prophecy possesses an intimate relation to the violated body. Focusing on the figure of the corpse, Meyers Usher examines the relationship among bodies, violence, and knowledge granted through prophecy, proving that ‘prophecy is a bodily business.’ Normally treated as language games, prophecy appears here in a new light, as special knowledge granted through the transgression of the body through either ritualized violence (marring the body) or mixture (mingling the animal with human, animate with inanimate), thus endowing it with a new vitality that is a condition of its prophetic meaning. Meyers Usher concludes that we often discover prophecy so prominently in tragedy because it ‘comments on the precariousness of knowledge – and on the inseparability of knowledge and violence.’ Nicosia turns to the body in time and shows how the texts and bodies of prophecy could be manipulated to more duplicitous ends. In Nicosia’s essay, we encounter a host of self-serving Parliamentarians in Samuel Sheppard’s play pamphlet series The Committee-man Curried. These men waste time and seek bodily pleasures, and Sheppard harnesses the period’s fascination with prophecy as a means for envisioning a more efficient, Royalist future. Together, these contributions point to the material dimension of prophecy: how the prophet’s body can be fashioned, violated, or adopted to manipulate. A thread running through all of these studies, and with which this introduction opened, is the continuity between the different temporalities that prophecy evokes. In their respective articles, Nathaniel Campbell’s ‘The Prophetess and the Pope: St. Hildegard of Bingen, Pope Benedict XVI, and Prophetic Visions of Church Reform’ and Martin Elsky’s ‘Prophecy and Poetry: The Second World War and the Turn to Biblical Typology in George Herbert’s The Temple’ traverse historical periods – the twelfth, seventeenth, and twentieth centuries – and study the refashioning of vatic voices from the past to take up questions of transhistoricism and presentism. Campbell studies Pope Benedict XVI’s turn to St. Hildegard of Bingen in Benedict’s understanding and approach to institutional reform. Hildegard experienced prophetic visions that depicted the need for the Church’s reform through encounters with the personification of the Church, Ecclesia, gendered female. For Hildegard, Ecclesia modeled an authority grounded in vulnerability and thus figured a hermeneutic openness to revision within and through history. Benedict found in the twelfth-century prophet a critique of institutions founded on the premise that history is the dynamic unfolding of providence to which the Church must remain receptive and malleable, ready to react and adapt. Taking a different tack, Elsky demonstrates how the implicitly anti-presentist scholarship of historicist literary critic Rosemond Tuve – whose work has left a deep and lasting impact on the scholarship of Renaissance poetry – was motivated by her own political investments. Through analysis of Tuve’s typological reading of George Herbert, Elsky demonstrates how considerations of prophecy – which is by its definition anachronistic, necessarily out of time – implicate the present of the critic in the past of the text. Elsky thus shows how World War II shaped Tuve’s seemingly strict historicist method, on which she herself ruminated in lectures delivered at Connecticut College. Our hope is that readers will respond to this call for renewed attention to prophecy and temporality with inquiries of their own, challenging in the process critical lenses that adhere to strict dualities of medieval/modern, superstitious/rationalized, and other problematic dyads that occlude our understanding of vatic language. The language, texts, and bodies of prophecy challenge commonplaces about a disenchanted modernity and point the way to new critical approaches to texts out of time. As we are writing this introduction in 2018, we recognize how social, political, and economic upheaval furnishes fruitful ground for new prophecies, new hopes for a future less contingent on seemingly abstract forces. But lives in medieval and early modern Europe were equally shaped by these desires, and we have much to learn about how prophecy from the past can teach us ways to read our current moment.